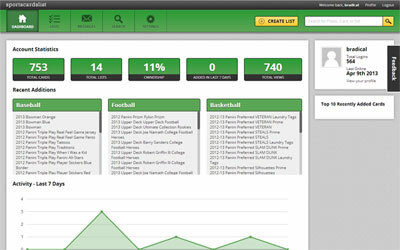 We are revolutionizing the way you collect and share information about your collection online. From the moment you start using Sports Cards List, you can start to track your collection, easily see your progress, locate those hard to find items for your collection and connect with other hobbyists. You can easily share your collection with others on the Internet or take your collection with on the go, with our mobile friendly platform. It's all part of Sports Cards List — and we are committed to making this best online resource for you and your sports card collection. Best of all, access to the site and your information will always be FREE! Fill out our short registration form and instantly get access to the site and start creating your customized online lists for your collection. You can create as many lists to catalog your collection as you want. Your lists will help you seperate out sets, player collection, trade lists or any other way you want to organize your collection. Easily search through our 128,814 sets and 7,052,800 cards to add into your lists and collection. With a single click, you can add cards from your search into your created lists.